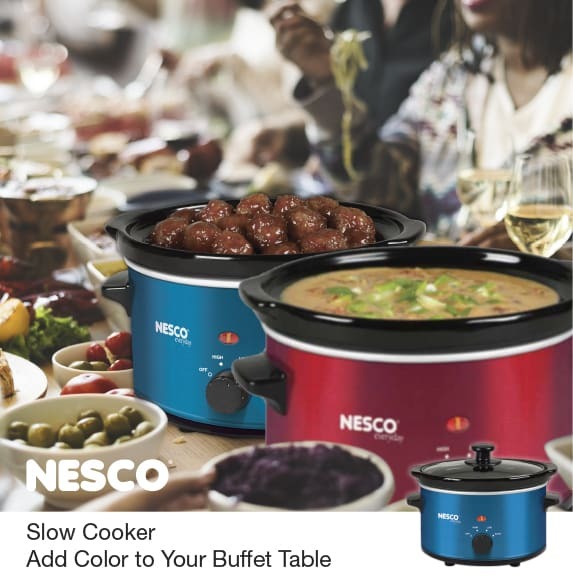 Home/NESCO Everyday, NESCO Tips, Slow Cooker/Add Color to Your Buffet Table with NESCO’s Slow Cookers! Keep your holiday appetizers and sauces tasty and warm in colorful 1.5 Qt Slow Cookers from NESCO. From rich brown meatballs and honey wings, to golden cheese sauces and hot bean dips, NESCO Slow Cookers helps make your table more festive. Lets us know what recipes you like to make in your NESCO 1.5 Qt Slow Cooker.